I'm still here! I've been busy being busy in busy South East London but I couldn't let a day like St Dwynwen's pass without making some kind of noise, C'MON! The photo is of a lovespoon given to Mr Chalky and I at our wedding. It's hand carved out of one piece of wood. 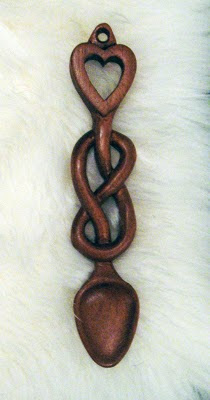 We have two more lovespoons of similar size, one especially carved for us with a daffodil and a french cockerel on it (I'm Welsh, he's French (and American)). It's quite a common thing for the the bride and groom to be given to in Wales (you know that small country next door to England?!) If you'd like to know the Welsh history behind lovespoons try reading here - don't worry, it's not in Welsh! If you ever happen by chance to stay in any of the motels and wood cabins we stayed in on our honeymoon roadtrip from San Francisco to Southern Oregon you might discover a trail of small wooden lovespoons I hid in the rooms. And as for the terrible love song, I believe the following song qualifies with one of the creepiest videos ever made!